I was interested to read your review of the Kia Niro. For whatever reason I don't feel particularly engaged with my soon to be one year old Honda HRV EX CVT. Difficult to explain but I got more pleasure out of driving a Jazz with an I-Shift after a lifetime of many cars including a raft of 4WDs. Life in London with a few long runs suggests a need for something not too large but with option of creating a large drop down boot space when moving larger items for others. We don’t want anything longer than an HRV but the previous hybrid Jazz does not appear likely to be replaced by a 1.5 DCT hybrid anytime soon. I sense Honda loosing the plot in the UK. Toyota Auris Hybrids are not much fun and a Prius seems too large. 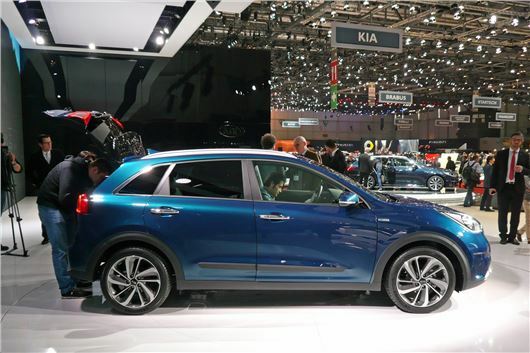 Did you find the Niro as good to drive or as comfortable as your diesel HRV? Any thoughts? Remember, I have an HR-V 1.6iDTEC EX manual, not a 1.5iVTEC CVT-7, so what I have is a very different car from yours. It's also on Michelin Cross Climate tyres that make a huge difference to its ride and handling. And has averaged a genuine 58mpg. So I'd have it in preference to the KIA Niro, but, because the Niro performs so much better than the 1.5iVTEC CVT-7, especially on hills, I'd have that in preference to your Honda, notwithstanding the fact that the interior is far less versatile. Avoid the Niro 'First Edition' and go for a 2 spec on 16-inch wheels. Today is a summer Sunday. I am not cycling. I have 2 motor-cars. One does about 4k miles a year; the other about 3k miles a year. In a good (active) year I cycle 3k or 4k miles. Not in 2016. I am not cycling this Sunday, nor most summer Sundays, because it is become too dangerous to be abroad on a cycle in these parts: namely, on the roads in and around the New Forest (around, in and out of Lymington). Since the inception of the New Forest as National Park, the traffic on spring, summer and autumn weekends (especially on a Sunday) is increased exponentially. Some local people suggest tenfold. The local authority reports that traffic is only slightly increased. I am sure this is correct if the traffic for 365 days of then year is taken and averaged. But if 12 summer Sundays were taken in isolation, I suggest more than quadrupled. Perhaps 6 fold or 8 fold - perhaps the suggested 10 fold? Motorists from Midland towns and cities flock to the New Forest as never before. Literally: as never before. It used not to be like this. 6 years ago, 10 years, 20 years and more ago) the car parks on the Forest were never more than a quarter full. Today, on a weekend (especially Sundays) the car parks are full and vehicles are parked willy-nilly along the roads. Such casual parking causes congestion. It impairs, even prevents traffic movement. And those responsible appear oblivious. In the name of sweet reason, is not a blocked road obvious - even to the dimmest, most inept of drivers? You know what I hate the most about this? Fat men with fat wives and fat children who sling 4 or 5 bicycles on the backs of their cars then drive them to places like the New Forest, unhitch their bipeds and ride them very slowly, wobbling all over the road for 3 - 4 miles, smugly believing they are saving the planet. In direct contrast, groups of the lycra clad in Northumberland have to contend with 1 in 3 hills and 1 in 3 descents and they really get some exercise. They also don't imprison non-pedallists in their homes like the London Cycle event does to residents of parts of Surrey. Apparently the London lot raised £12 million for charity. That is before subtracting the cost of the police helicopters, the police cars, the police motorcycle outriders, the ambulances, the road closures, and the cost to everyone entrapped by them. I have just sold my beloved 2-seater sports car as I was finding getting in and out to be increasingly difficult. I am looking to buy a 4 seater convertible with a large boot to take two sets of golf clubs. At 68 I would like a smooth comfortable ride and not a low vehicle that makes getting in and out difficult. I have a budget of about £25,000. What cars would you recommend that I look at? Are there any other factors that I should consider? If it's a convertible with a folding hard top then the hard top when down will take up most of the boot. But £25k should get an ex demo A3 1.4TSI ACT, which is a proper soft top convertible with a decent boot and a very sweet drive. I hit a mega-pothole with both nearside wheels in my 3-month old 5-Series and, since then, have had high-frequency vibration at motorway speeds through the steering wheel and floor. The wheels and wheel balance seem ok. What else could be the cause? Seem ok? Have you had them checked or just looked at them? If you just looked at them then one or both of the rims are probably buckled. If these are 18-inch or more they almost certainly will be. I've spotted a nearly new and popular performance saloon coming up at auction. A Mercedes, but put in the auction by a BMW dealer. It has a low (warranted) mileage and is listed as Grade 1, with the V5 present. I'm interested in bidding, but curious as to how or why such a car would be sent to auction in the first place and whether it's likely to be a bargain? Surely, it would find an eager buyer (trade or private) through more conventional routes? Is there a catch? What is it? An AMG 63? Maybe someone p/xd it for a BMW because they didn't like it. And the dealer has a policy of sending all non BMWs to auction. Nevertheless, take care. Check form the reg with MBUK that it is still warranted. If it's a good car you may have to bid against an MB dealer to get it. If not, ask yourself why not? My A-Class 170CDI Elegance Auto is now 15 years old and 100,000 miles, and is due for retirement. It was 8 months old when we bought it. My wife and I require a comfortable, reliable automatic capable of carrying 5 people or 2 people and 2 racing bicycles. We are 67 and 69 years old and travel about 5,000 miles a year, mainly locally but with 2 or 3 long trips per year. I have a rather long short list of Honda Jazz, or HRV; Nissan Note or Quashqai; Mazda CX-3; Peugeot 2008; Ford B Max; MINI Countryman; BMW 2-Series Active Tourer; KIA Venga; Hyundai I30 SW; Renault Captur and Suzuki Vitara. I am able to spend £18,000 + the A-Class. We are rather afraid of modern technology, and worry about our ability to understand modern infotainment systems (we don't have mobile phones). We would specify wind-up window and steel wheels if we could, but I concede that we will have to put up with some of these ill-conceived fashion items. I would be grateful for your advice on reducing my list. Your A-Class isn't really worth anything as a p/x, maybe £500, so you might be better bargaining down a cash purchase and either selling the A-Class yourselves or donating it to http://www.giveacar.co.uk If a dealer gives you anything for the A-Class it will be instead of a discount. You don't say if you want auto again but if you do that knocks your best choice such as a new Dacia Duster 1.2 TCe 125 at £12,895 off your list. You have enough for a Jazz 1.3iVTEC CVT-7 which is a bit slow but very commodious and very economical. You’d be pushing it to get an HR-V 1.5iVTEC CVT-7 for your money. You should get a Peugeot 2008 1.2 Puretech EAT6 auto after a bit of horse-trading. Or a Ford B-Max 1.0 120PS EcoBoost Powershift. Or a Renault Captur 1.2 TCe 120 EDC. You’re way off a MINI Countryman or BMW 2 Series Active Tourer unless you can find an ex-demo. A KIA Venga or Hyundai ix20 is affordable with the 6-speed dual clutch auto. As is a Vitara 1.6 auto but not the much better 1.4T BoosterJet auto. You could add the KIA Soul but the new KIA Niro is priced out of reach. If you've checked the entry in /carbycar you can read all the complaints received about the Golf Mk V and Mk VI and if you're wise you'll compare these with the complaints over similar sized cars. Renaults are more reliable. Hondas, Hyundais and KIAs seem to be the most reliable (in terms of least complained of). My stepson has contacted me regarding a £980 quote for a major service including cambelt change and MoT (not sure about VAT) for his 2011 Volkswagen UP at a SW London VW dealer where the car was purchased. Is this what you would expect cost to be? No, not for what is supposed to be a cheap economy car. But I don't know its mileage or what sort of a state it is in. I can tell you that a timing belt, tensioner and waterpump change on a FIAT 500 1.2 is £300 + VAT, so if the VW dealer is milking this job your stepson should look elsewhere, such as wheelbase.co.uk in Hersham. My daughter has a KIA Carens and the locking wheel-nut key has gone missing. She knows she had it earlier this year. The supplying dealer cannot tell her what the key code is so that a replacement can be obtained and it is allegedly not recorded in the service book (the car is at the garage so she cannot check). The dealer is saying he will have to cut the existing nuts off as he doesn't have a master key. Is this really true or has the dealer been careless in not recording the key code? The dealer has done all her maintenance to ensure the warranty is secure. Discovered because the ignition lock broke, which has taken several weeks to replace, and worn brake pads were noted on inspection of the car. You can find out if it is still registered here: https://www.gov.uk/get-vehicle-information-from-dvla/ You can request the registered keeper here: https://www.gov.uk/request-information-from-dvla/ (But you have to have a reason, such as the car with the registration damaged your property.) You can find out if it is insured here: http://www.askmid.com You can check the MoT history here: https://www.gov.uk/check-mot-history Final port of call is the relevant motorcycle club, which you can Google. I've seen a Peugeot 50008 2L diesel MPV for £6K with 124K on the clock. Bodywork and interiors fine. It's the e act spec I want and they're v hard to find so I'm tempted by this one. It's been a co pant car and serviced at fairly long intervals of 19, 37, 58, 84 and 108K miles. I'm a novice buyer and have no knowledgeable car buff to take with me! Hoping to look at it tomorrow. What do you think? And if you say it's worth a look an you explain in lay and terms what I should check exactly please? Happy to lay on the floor to see under the car and get hands dirty in the engine etc. ADVICE NEEDED QUICKLY!!! All replies today appreciated thanks. I don't want to make an expensive mistake if I can help it! !